Though hubby was home this weekend but we were unable to really do something fun as a family as it is the last weekend that little one can spent the time doing last minute revision as well as getting composed. Even though we spent time at home, we didn't really do full force revision as I didn't want her to be stressed out after all, there were lots of extra time from tuition this week as well. Thus we rest and relax in between and doing things that were relaxing. Like making Roti Prata and cooking Ipoh Hor Fun which my little girl has been requesting. Actually I spent the last few nights watching YouTube on lots of How To. One video caught my attention was How to flip a Roti Prata taken from ieatishootipost. Dr Tay is really comprehensive and the instruction was detailed and with a video that I finds interesting. Yes I am a visual person. Words lost me most of the time. So I went about gathering all the necessary ingredients. Of course not the 25kg flour that he lugged home. I substituted it with his recommendation. Anyway, I don’t know what got into me but I somehow read the instruction wrongly. Geesh, didn’t I say comprehensive and yet I made this blunder. Of course I have to be blamed because I was way too eager to start off. You see, my kiddos love Roti Prata! I remembered my son ate this for the WHOLE year during his primary school days. It is also this dish that he started picking up spicy food. Now it is my girl’s turn. She won’t touch anything spicy except those curries that come with Roti Prata. Every Halloween, we will make a trip down to our favourite Roti Prata place after our trick or treat. It is quite funny walking into the restaurant with those hideous make up and getting all the stares on my kiddos. Anyway, this year, we won’t be able to do it as little one is having her tuition. Pity but I guess we will have to move on from here. 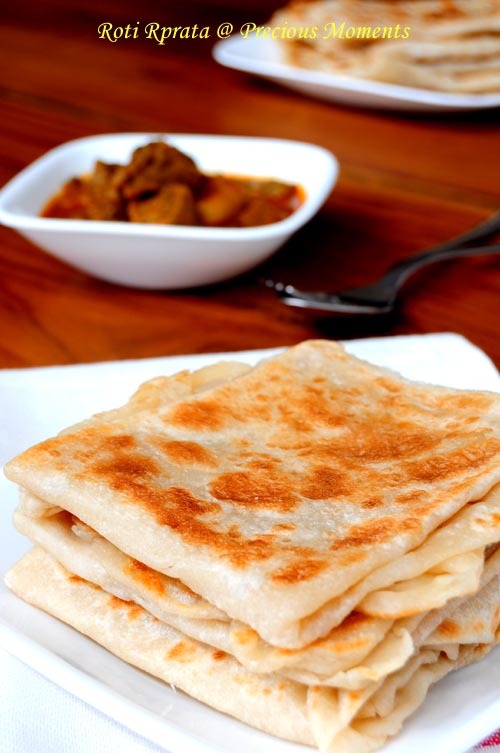 So here I present you my home made Roti Prata with store bought Mutton Curry that is available near my place. Actually I wasn't happy with the outcome last night and done another batch right after. Overall, I was able to achieve the crispy exterior except it is rather bland but once dipped with curry, it makes up for it. After trying twice, my conclusion is that you got to stretch the dough really thin. I was pretty clumsy with the flipping method and thus opted for the second recommendation that was the lay and stretch method. Try to stretch it as much as possible and paying attention to the rim of the dough as tendency of leaving a thick "rim" if overlooked. This will results in a dough like texture on the prata. Personally I find that it helps with more oil so that it won't break that easily. Will I consider this a success? Yes! Next one I will try the tenderly version. Thanks Dr Tay for all your hard work in researching! And as for dinner, we had Ipoh Hor Fun. 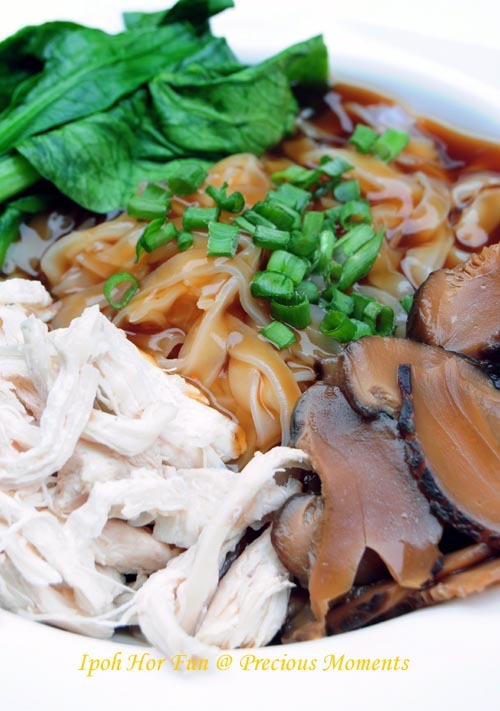 This dish definitely brought back fond memories of my childhood days living in the East. Its sure been a long time since I last prepared this one dish meal. The last time I cooked this was way back in 2005! Gosh! that was long time ago. Even though it is one of my favourite but I don't know why I hardly cooked this at home. I guess it must be good for my girl finished her dinner first! (for she usually the last to finish). Guess I should cook this more often from now on. Bring chicken broth, fish sauce, soya sauce, the juice from the steaming and pepper to a boil. Adjust the flavour to your liking. Depending on how dark you prefer, add your dark soya sauce accordingly. (Reserve two ladles full of stock for braising the mushroom). After getting the taste right, mix the potato starch with water and slowly pour into your sauce, stirring constantly. The broth will thickens. I didn't like mine to be so starchy, so tune accordingly. Serve with a dash of sambal chilli if you prefer it hot. Put the above into a pot. Fill with another cup of water and bring it to a boil. Season with soya sauce, dark soya sauce and oyster sauce to your liking. Add pepper. Slowly simmer for ½ hour till mushroom is soft. Mix liquid and whisk them well together. Add in dry ingredients and mixed well. Knead for 10 min with 5 min interval on speed 2 in KA. Repeat cycle if you wanted a softer dough. Divide dough into balls (100g) each, making sure there isn’t any crack or fold lines. Oil the dough generously before placing them into a container to proof for 8 hours or more. After proofing, place balled dough into a well oiled table top. Flatten with your palm and do the lay and pull stretch method until you reached a very fine membrane looking dough. Oil generously throughout process, making sure the rim of the dough is thinned out. Once you reached that texture, fold the dough. (pls see Dr Tay’s video). Heat frying pan with oil and pan fry till crisp. I am very amazed to see roti prata coming out of your kitchen. It is a feat indeed. All the more amazing when it looks so professionally done. All the best to your girl's exam. From the way you described her, she is every mother's darling. What a coincidence, Edith! 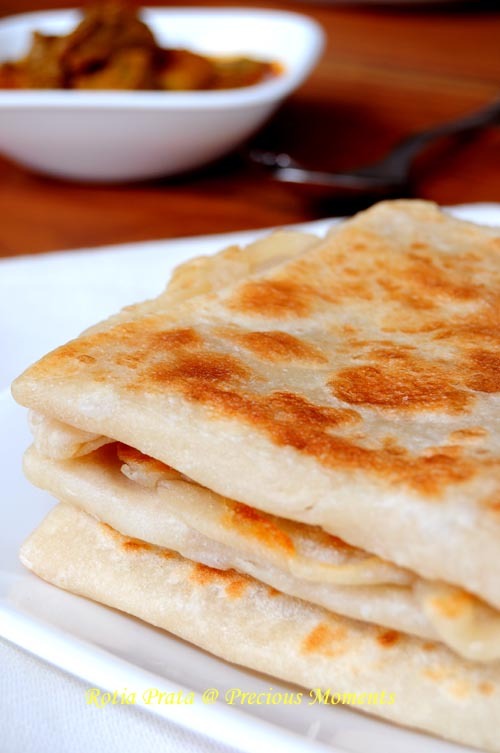 watched Dr. Tay's how-to video yesterday...then started craving roti prata =P haha. I don't think I'd be able to flip the prata that nicely..hehe. Your prata looks great!! Wishing your daughter all the good luck for her exams! I still can't flip so I opted for his second method. Have fun. Go for it. Quite fun.